“This is what you have to do, if you want the people to build statues of you on horseback.” Valéry Giscard d’Estaing was doubtless being whimsical when he urged his colleagues to make bold decisions about the future of Europe. But the former French president’s remark offers a telling insight into the mentality that created the great euro-mess of today. The EU is now having to deal with the consequences of the hubris of the “great Europeans” of a previous generation. The people who created the euro – men such as Helmut Kohl, the former German chancellor, and Jacques Delors, the one-time head of the European Commission – shared Mr Giscard d’Estaing’s eye for the history books. But their dream of leaving a legacy of a United Europe, with a single currency at its core, has turned into a nightmare. In the middle of a full-blown economic and political crisis it might seem pointless – or even vindictive – to criticise the statesmen of yesterday. But answering the question “who is to blame?” will be important in resolving the euro crisis. The country or groups that end up shouldering most of the odium for the crisis will emerge with their interests and worldview damaged and in retreat. Broadly speaking, there are three groups competing to be the villain of the piece: the Germans, the southern Europeans and the “Anglo-Saxons”. The anti-German case is that Europe’s most powerful economy has refused to accept the mutual obligations that are entailed by a common currency. The euro system, it is said, now massively favours Germany. However, rather than rebalancing the eurozone by mutualising debt and boosting domestic demand, Germany is reaping the gains while imposing austerity on the rest of Europe. Unsurprisingly, this view has almost no takers in Germany or in the other creditor nations of northern Europe, such as Finland and the Netherlands. The northerners believe they have “done their homework” by pushing through painful reforms. They have also subscribed to bailout funds worth hundreds of billions of euros. The dominant northern European narrative is that the crisis is the fault of spendthrift and corrupt southerners, whose goal remains a life of leisure funded by their harder-working northern neighbours. Geert Wilders, the leader of the Dutch Freedom party, accused his country’s prime minister of being “slavishly on his knees before the Italian and Spanish mafia”. Most northern European politicians would refrain from inflammatory language of that sort. Yet distrust and exasperation with southern Europeans is common. British and US commentators might think they are safely distant from all this name-calling. But that is an error. There is a strong strain of thought within Europe that the real villain in this crisis is financial capitalism, as practised in Britain and the US. José Manuel Barroso, president of the commission, remarked tetchily at a G20 summit that “the crisis did not originate in Europe . . . This crisis originated in North America and much of our financial sector was contaminated by unorthodox practices”. Many European commentators have latched on to the role Goldman Sachs played in helping Greece to massage down its debt figures in the years before the crisis. This kind of argument swiftly slides into conspiracy theory. There are top officials within the EU who seem genuinely to believe that the Financial Times is part of an “Anglo-Saxon” conspiracy to destroy the single currency. (Not true, in case you were wondering.) For many pro-Europeans, it is tempting to bury differences within the eurozone by looking for scapegoats elsewhere – in the “Anglo-Saxon” financial markets. These rhetorical exchanges are of more than academic interest. By shaping the debate, they will also shape the future course of the crisis. The argument that Anglo-Saxon capitalism is to blame has already led to a drive for tighter European financial regulation – and a mini-crisis in relations between the eurozone and Britain. Further moves to bash the Anglo-Saxons could end up with Britain being pushed closer to an exit from the EU itself. By contrast, if southern Europeans collectively agree that Germany is the real villain of the piece, they may attempt to isolate Germany within Europe. And if Germans continue to believe that cheating in southern Europe is the problem, they will insist all the more on austerity. So here is a possible compromise. 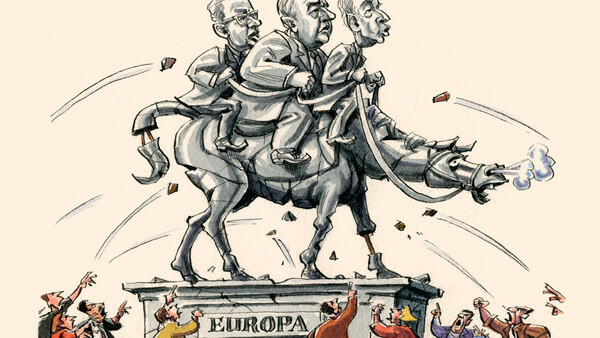 Rather than attacking each other, Europeans should blame the “great Europeans” of the past. Men such as Mr Kohl and Mr Delors were truly “great” in other contexts. Mr Kohl drove through the unification of Germany. Mr Delors constructed the European single market. But when it came to the euro, they pursued their grand vision while ignoring the objections of those who questioned whether a single currency could work for such diverse economies. Today’s Europe is living with the consequences of their hubris. A Strange Resignation: Why was Petraeus Really Ousted?